When using a communication system such a cellular phone or a radio set inside the vehicle, a separate external antenna must be fitted. When a cellular phone or a radio set is used with an internal antenna alone, it may interfere with the vehicle's electrical system and adversely affect safe operation of the vehicle. WARNING Don't use a cellular phone when you are driving. You must stop at a safe place to use a cellular phone. • If the temperature inside the car is too high, open the car windows for ventilation before using your car audio. • It is illegal to copy and use MP3/WMA/ AAC/WAVE files without permission. Use CDs that are created only by lawful means. • Do not apply volatile agents such as benzene and thinner, normal cleaners and magnetic sprays made for analogue disc onto CDs. • To prevent the disc surface from getting damaged. Hold and carry CDs by the edges or the edges of the center hole only. • Clean the disc surface with a piece of soft cloth before playback (wipe it from the center to the outside edge). • Do not damage the disc surface or attach pieces of sticky tape or paper onto it. • Make sure on undesirable matter other than CDs are inserted into the CD player (Do not insert more than one CD at a time). • Keep CDs in their cases after use to protect them from scratches or dirt. • Depending on the type of CD-R/CDRW CDs, certain CDs may not operate normally according to manufacturing companies or making and recording methods. In such circumstances, if you still continue to use those CDs, they may cause the malfunction of your car audio system. Pressing the [AM] button selects the AM band. AM Mode is displayed on the LCD. Turns to FM mode and toggles FM1and FM2 when the button is pressed each time. Turns to FM or AM mode, and toggles in the order of FM1➟FM2➟AM➟FM1... when the button is pressed each time. Turns on/off the set when the IGNITION SWITCH is on ACC or ON. If the button is turned to the right, it increases the volume and left,decreases the volume. • Adjusts the volume of the car audio system. Rotate clockwise to increase the volume or counterclockwise to decrease. Push ~ buttons less than 0.8 second to play the channel saved in each button.Push Preset button for 0.8 second or longer to save current channel to the respective button with a beep. • When the button is pressed, it automatically scans the radio stations upwards. • The SCAN feature steps through each station, starting from the initial station, for ten seconds. • press the [SCAN] button again to stop the scan feature and to listen to the currently selected channel. • SOUND <PA760YF> Pressing the [ FOLDER ] button to select the sound the following order : Sound Setup, Variable EQ Select the Sound Setup and press [ENTER] the button to set. Pressing the [ENTER] button to adjust the Sound Setup the following order : BASS, MIDDLE, TREBLE, FADER, BALANCE. Select the BASS and press the [ FOLDER ] button to set. Use the same method to adjust MIDDLE, TREBLE, FADER, BALANCE and press the button to [ENTER] complete and exit from Sound Setup adjustment mode. • Variable EQ<PA760YF> Pressing the [ FOLDER ] button to Select the sound the following order : Sound Setup, Variable EQ Select the Variable EQ and press the [ENTER] button to set. Pressing the [ FOLDER ] button to select the Variable EQ the following order : Normal, Powerful, Concert Select and press the [ENTER] button to complete and exit from Variable EQ set up mode. • XM It will be able to change the XM display. ex) Display by category/channel or artist/song title. Select the XM Display through the [ FOLDER ] button(for PA710YF, Turn the control knob), and press the [ENTER] button(for PA710YF, press [TUNE] knob) to complete and exit XM setup mode. • HD RADIO This funtion is used to enable FM/AM HD RADIO receptions, and detail display. 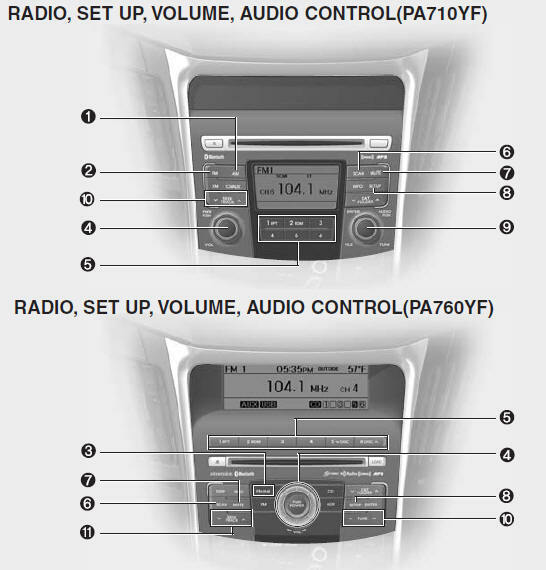 Press the [ FOLDER ] button to select the HD RADIO setup the following order : HD RADIO FM, HD RADIO AM, Details. Press the [ENTER] button to the HD RADIO setup and can be turned ON/OFF through the [ FOLDER ] button. Press the [ENTER] button to complete and exit HD RADIO setup mode. • CLOCK <PA760YF> Pressing the [ FOLDER ] button to adjust the clock in the following order: CLOCK SET, TIME FORMAT, RETURN. Adjust the CLOCK SET and press [ENTER] button to set. Use the same method to adjust TIME FORMAT and press the [ENTER] button to complete and exit and from clock adjustment mode. Turn this control while listening to a radio channel to manually adjust frequency. Turn clockwise to increase frequency and counterclockwise to reduce frequency. Pressing the button changes the BASS, MIDDLE, TREBLE, FADER and BALANCE TUNE mode. The mode selected is shown on the display. After selecting each mode, rotate the Audio control knob clockwise or counterclockwise. Turn the control knob clockwise to emphasize rear speaker sound(front speaker sound will be attenuated). When the control knob is turned counterclockwise, front speaker sound will be emphasized(rear speaker sound will be attenuated). Rotate the knob clockwise to emphasize right speaker sound(left speaker sound will be attenuated). When the control knob is turned counter clockwise, left speaker sound will be emphasized(right speaker sound will be attenuated). 10. Manual Channel Selector Press the [ FOLDER ] button while listening to a radio channel to manually adjust frequency. it increases the band frequency to automatically select channel. Stops at the previous frequency if no channel is found. it reduces the band frequency to automatically select channel. Stops at the previous frequency if no channel is found.